Size: Gray whales range in size from 35 to 45 feet long, and weigh 30 to 40 tons­; females weigh more and are longer than the males. Gray whales are intermediate in size in comparison with other well-known whales. By comparison, Blue Whales are 80 to 100 feet long and Orca Whales / Killer of Whales can grow 15 to 25 feet long. 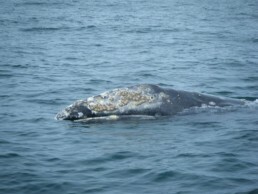 Coloration: Gray whales are so called because of their mottled gray coloration. The natural pigmentation can range from almost black to almost white, and can include white spots that range from the size of a marble to a basketball. This mottled appearance is enhanced by barnacles, barnacle scars, and whale lice. Rostrum (Head Region): The rostrum extends from the tip of the snout to the blowholes, a length of about six feet. The rostrum of adult gray whales is covered with barnacles and whale lice. Gray whales that feed on the bottom rub off barnacles and leave barnacle scars. Young gray whales have a dimpled rostrum with one hair in each dimple. Eyes: The eyes of the gray whale are brown in color and the size of an orange. Eyes are located at the end of the mouth line, seven or eight feet from the rostrum tip. Blow: The gray whale blow is 6-10 feet high and is heart-shaped if seen from behind on a calm day. About 100 gallons of air is expelled from the blow at speeds that range from 150 and 200 miles per hour. Dorsal Hump: Gray whales have no dorsal fin; instead they have a dorsal hump at the end of the back. Knuckles: 6-12 bumps called knuckles are seen behind the gray whale’s dorsal hump. In some whales they are very distinct and in others they are not. Baleen Plates: 300 blonde baleen plates about one foot long hang from the top jaw. Bristles on the inside edges of those plates trap food organisms. Blowholes: Gray whales have two blowholes like all baleen whales. Throat Grooves: Two to five throat grooves on the bottom of the throat expand when the whales are feeding. Flippers: Behind the throat grooves are pointed, paddle-shaped flippers. Tail Fluke: An adult’s tail fluke is 9 feet wide. When the tail fluke goes under the ocean’s surface it leaves a characteristic print called a “fluke print”. Fluke print: A large circle of smooth water formed by tail fluke turbulence when a whale dives.